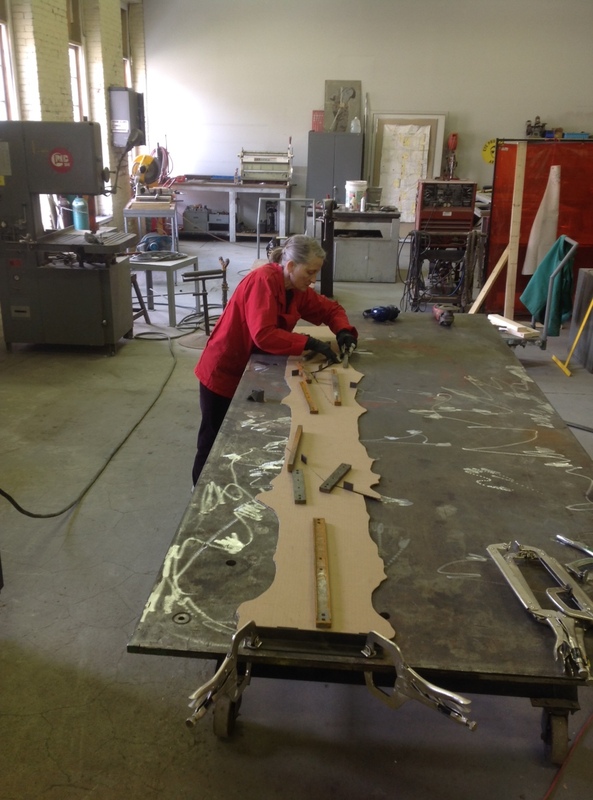 It’s not so much an armature, but rather a beautiful steel sculpture that I will be filling with stained glass according to Jason Middlebrook‘s design for “Cottonwood Plank“. I’d made cardboard templates from my earlier drawing of the plank, and my first task was to transfer this onto the welding table with chalk. 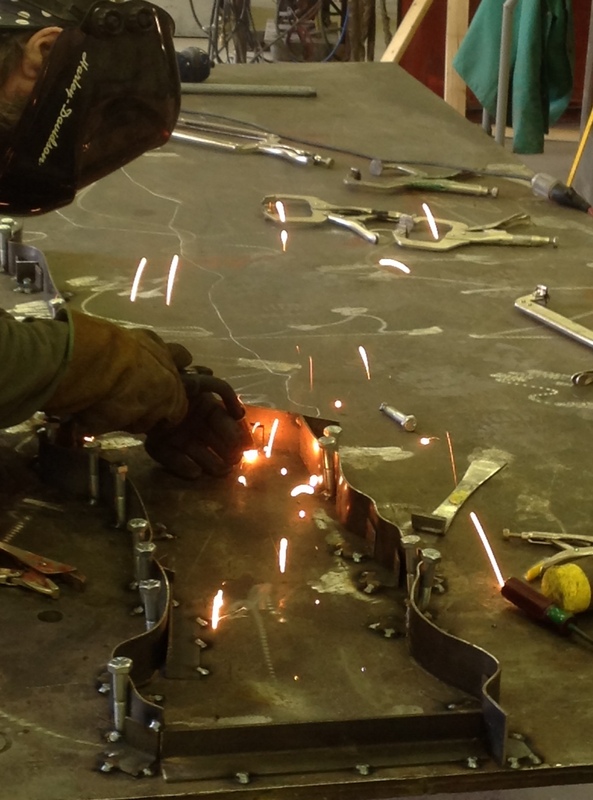 Richard started re-creating the drawing with a ribbon of 2 inch by 1/8 inch cold-rolled steel flat-stock. Richard tacked a short length of angle-iron to the table to hold the bottom of the plank in place. He then welded the beginning of our flat-bar to the angle iron and we started cold-working the flat-bar, curve by curve, according to the drawing. 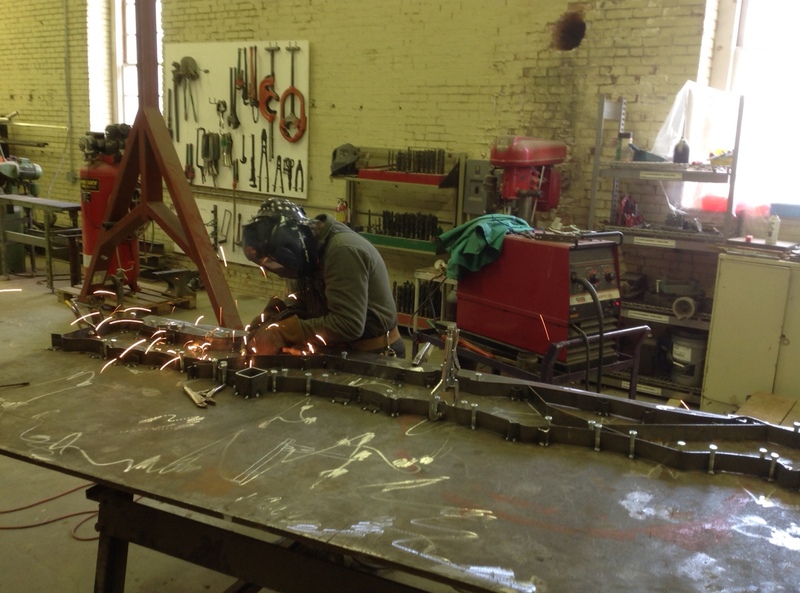 We figured out a technique that was a lot like leading up a stained glass window, but with steel instead of lead. 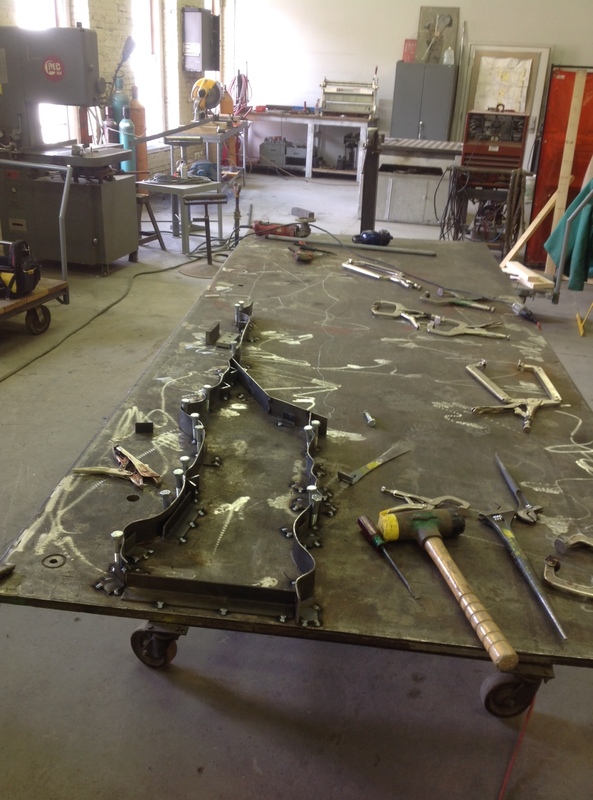 Richard tacked bolts and scraps of angle iron to the table to secure the curves, one by one, as we made our way around the perimeter of the drawing. 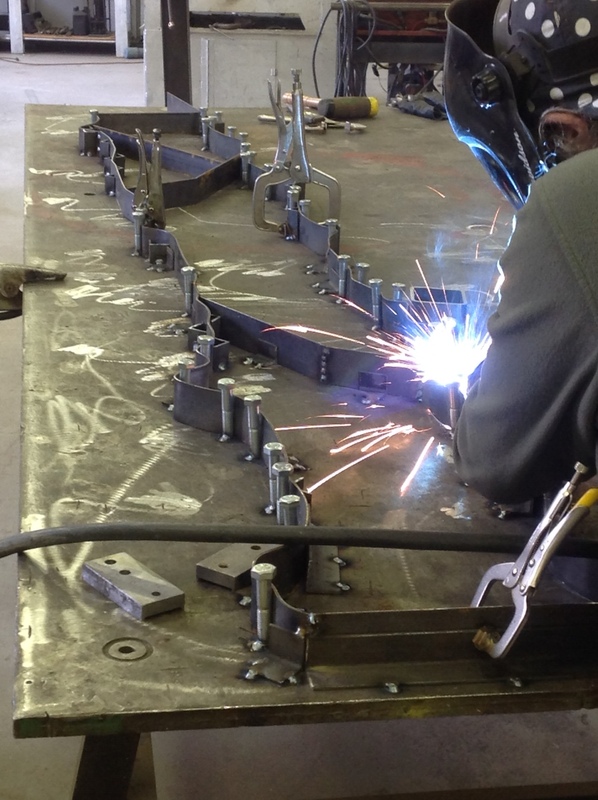 It was important to try not to weld the flat-stock ‘ribbon’ itself to the table! 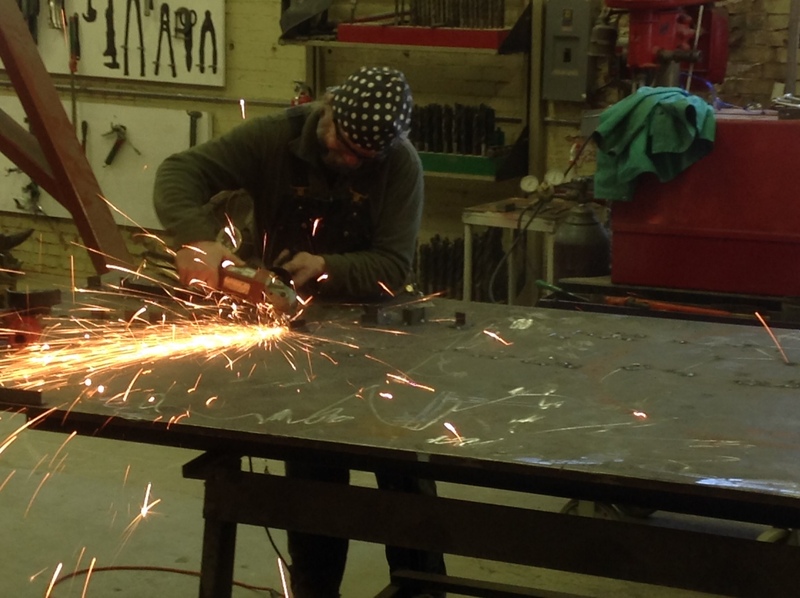 Sculptor, Richard Criddle striking an arc with MIG welder in the background. 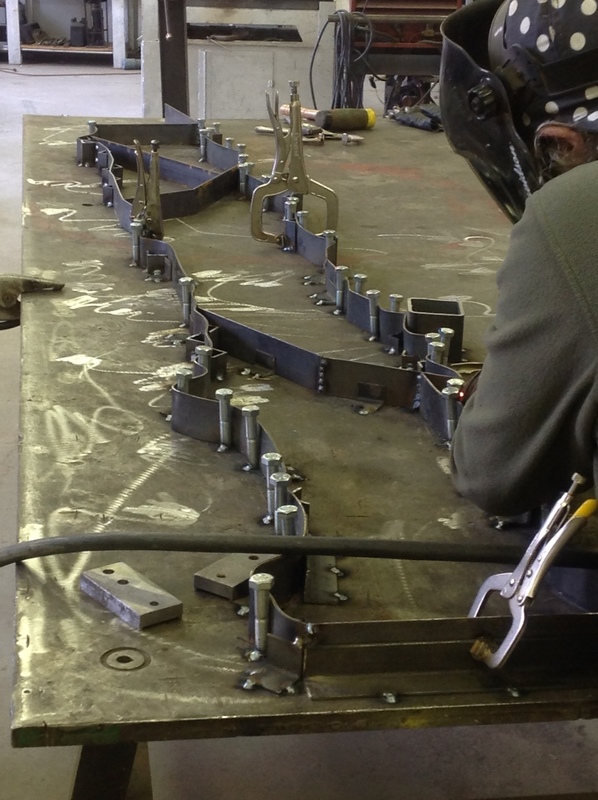 We gently levered the flat-stock ‘ribbon’ out of it’s jig, which you can see here still welded to the table. 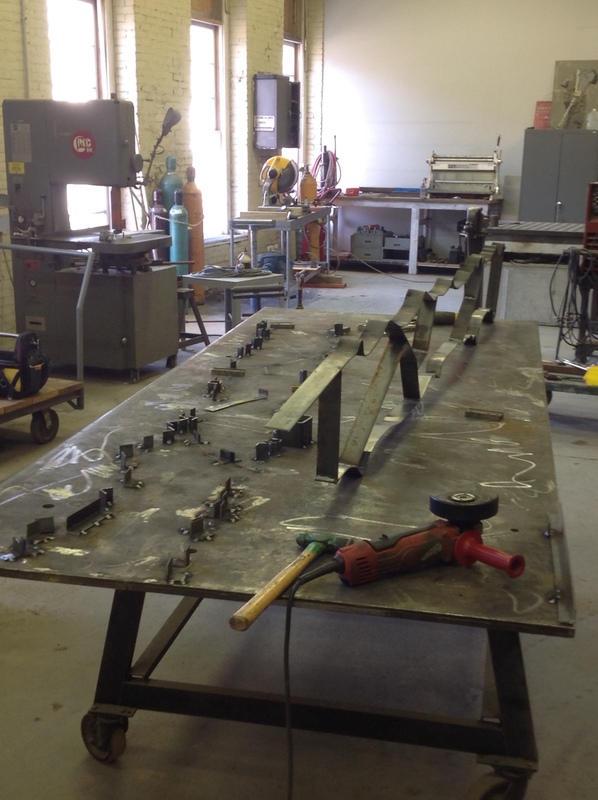 Someone asked how we got the jig off the welding table when we’d finished, well… tediously! It took over an hour to smack off the bolts and pieces of angle iron and grind the surface back smooth. Jason stopped by a few days later to see how his piece was progressing. For Bostonians, there’s a lovely Middlebrook to be seen at the entrance to the exhibition Expanding the Field of Painting at the ICA.